Tea comes from a magical family. All of her sisters are witches. But when Tea accidentally raises her brother, Fox, from the dead, she realizes that her magic is nothing like that of her sisters. She is a bone witch, and she is feared and shunned for her powers. Finally, under the guidance of another bone witch, Tea gains an education and learns to harness her powers of darkness. 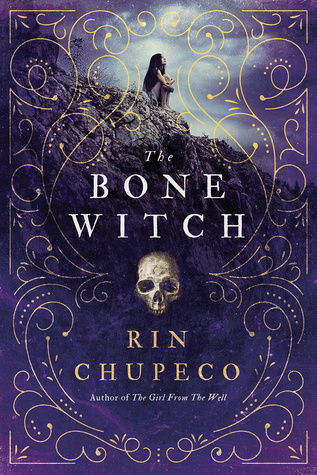 I don't even have the words to describe how much I enjoyed The Bone Witch. This book is absolutely fantastic. I can't believe it took me so long to pick it up. Anything I say about this book will sound like it was written by a child compared to the eloquence of this book, but I will try. The best thing about The Bone Witch by far was the writing style. The writing is dark and lyrical and you can easily find yourself completely lost in the story. The characters were described with such detail that they jumped off the page and felt real. While the book does jump right into the story without much initial introduction to the world, as the story continued, I found that I could clearly picture every aspect of it. If you like lyrical and descriptive stories, you will be salivating over The Bone Witch. If you want a lot of action in your books, you will not find it here. But it is very much worth the read anyway. Stylistically, The Bone Witch reminded me of The Name of the Wind by Patrick Rothfuss (another absolutely fantastic read, by the way). The story is told in alternating perspectives - from Tea, as she recounts the past five years of her life as a bone witch, and from the man who is interviewing her for her story. The plot moves slowly through Tea's education, but details about her from the perspective of the interviewer are interspersed throughout the book, leaving the reader wondering how this young girl became such a powerful dark witch. I assumed that the remaining books in this series will continue in the same format, until Tea's tale of her past finally intersects with the interviewer's notes on the present. The twist at the end of this book was spectacular. I seriously cannot wait for the next book to be released so I can devour it. I was hooked from the first page of The Bone Witch and I want to be back in that world so badly. You will not find a lot of action, adventure, or romance in this book, but it is so beautiful that you have to give it a try. It will be so worth it.